In this paper, a method using cavitation jet is proposed to remove marine creatures adhered to the body of a ship. The flow with the cavitation jet is produced using a high-pressure pump and cavitation nozzle with an orifice plate. Rebound shock waves are expected to be continuously generated in the cavitation jet flow. In order to observe the behaviors of the rebound shock waves, experiments are carried out using the Schlieren method in a water tank. From the results of the visualization, it is found the generation frequency of the rebound shock wave reaches its peak at a close position to the nozzle exit. 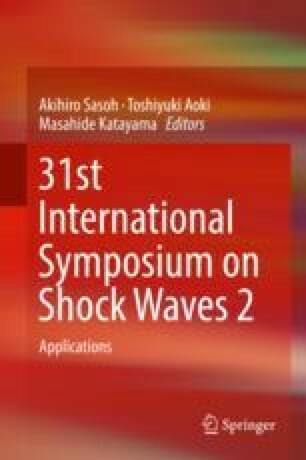 The behaviors of the rebound shock waves are also investigated under the influence of a wall boundary beside a cavitation jet. The results show that the position where the maximum generation frequency is obtained is at several ten times of an orifice diameter from the nozzle exit, and the generation frequency decreases due to the effect of the wall boundary. A part of the study was supported by JSPS KAKENHI Grant Number 16H04600. In addition, we also would like to sincerely thank NAC Image Technology Inc. for the supply of camera.